The Steinbrenner Warriors Football coaches and captains accepted the award on behalf of the rest of the Steinbrenner Football Team. The team is proud that they have managed to keep their seven year streak alive. For months, student-athletes train hard while maintaining good grades, which isn’t an easy feat. 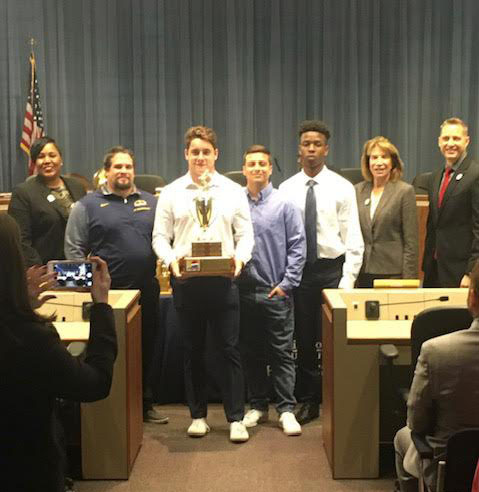 The Steinbrenner Warriors Football team has done exceptionally well this season and has been recognized as the football team with the highest average GPA in Hillsborough County. This achievement is a testament to both the athlete’s dedication to their extracurricular activities, their school work and the coaches’ ability to motivate their players. “I think when you play football it kind of keeps you in line, it makes you have a schedule; you only have some time. So with the time you do have off football during the mornings or at night, you need to get down to the ground and do your homework,” said sophomore Garret Cates. The team’s educational success isn’t anything new to Steinbrenner, since this will be the 7th year in a row that the team will be recognized with this award. The hard work the team puts in on and off the field has been known for years by the support of their dedicated coaches. On the Steinbrenner Football twitter page, the coaches had congratulated their hard-working players for their academic success last semester and even poked a little fun at the long streak the teams had over the years.